Another Vlad novel, and one I’m pretty happy with. I have a lot of sympathy with people who want to read the books in chronological order, so I wrote this one to help them out: it falls before and after Yendi. Heh heh heh. It also provided me with an excuse to read Clausewitz, which was actually fairly entertaining. The character of Napper is loosely based on the late Bruce Beesman, a guy I played a lot of poker with, and whom I miss. This one is my favorite Vlad book. I like the plot and that we get to see Vlad in a situation that is so far outside his comfort zone, but still quintessentially Vlad. Plus it’s got Morrolan being all Morrolan-y and Sethra being inscrutable. And of course, “How about you do the killing and I do the irony,” which may be my favorite Loiosh quote of all time. Thank you for considering the plight of your poor readers. 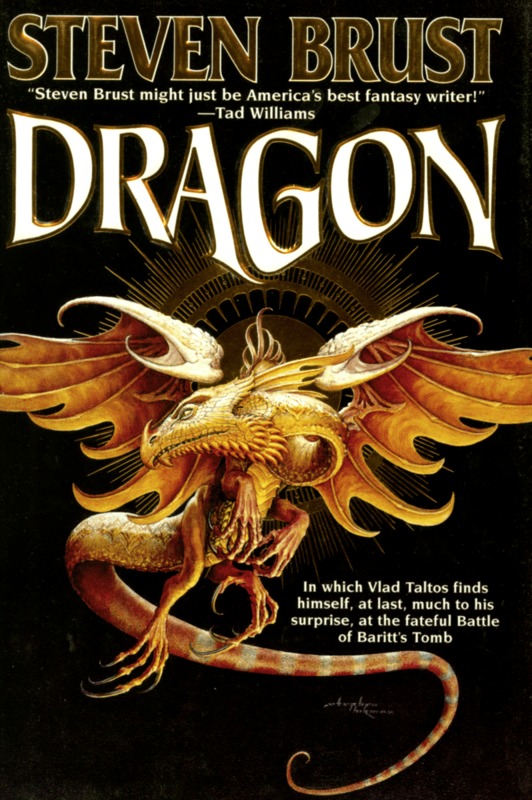 I had the pleasure of starting this series after the publication of Dragon, so by the time I’d gotten through all the books I was lucky enough to jump right into Issola. By the time Dzur came out, I got half way through it before I realized that my goldfish memory had no idea what was going on. Sobbing the entire time I quietly put the book back on my shelf and resolved not to read anymore of it until I had the entire series in hand. So I prowled bookstores daily around the release dates and through considerable self control, managed to keep my promise to myself. Until Tiassa. There was something about Tiassa. It’s matte cover, perhaps? The different format of the spine? The amazing illustration on the front, taunting me, seducing me from my shelf?! I’m a weak woman. So I read the entire series again and when I closed Tiassa for the final time I quietly turned on my computer, looked for the release date of Hawk, and cried a little inside. There’s nothing for it. I’ll have to re-read every single book when the next one comes out, and the next, and the next. And I’ll love every minute of it. Especially Dragon. It remains one of my favorites. 2. Damn. My plan had been to write the books so each one stands on its own. Oh, well. III. I’m hard at work on Hawk, and, with any luck, I’ll have a draft finished soon. Tor well, I believe, get it out fairly quickly after that. d. Meanwhile, The Incrementalists, by me and Skyler White, will be out in September. Yes….I get that too….it’s like a good bye again. In the relations of a weak Government and a rebellious people there comes a time when every act of the authorities exasperates the masses, and every refusal to act excites their contempt.